On Monday Evening, February 12, ’66. This is the first original Troupe of genuine Indians who have exhibited for the last eighteen years throughout the principle cities and towns in the United States and Canada, the wild grand scenes of their customs and native life in the far and distant plains of the West. Admission, 25 cents. Reserved Seats, 50 cents. Now, I need to caution all my readers not to take much of anything it says too seriously. This is after all entertainment and in order to get the audience’s attention you need to give them good reason to part with their money. Hype is the name of the game in this time period and there are no fact checkers making sure folks tell the truth. These names are all stage names created to sound exotic and inspire curiosity among potential patrons. Still, they are very valuable to have. If someone used the name once, it is likely they used it at other times. I can continue researching early circus and other traveling entertainments searching for folks using these names. I have already spent a day searching without finding anything more. It took two years to locate this clipping, so I am not expecting any quick answers at this point. A member of the troupe may have been performing for 18 years and a member of the troupe may have played in Columbus, Ohio nine years ago, but it is extremely unlikely this specific group of people has been together very long. I have been unable to find any other evidence of the group or other members. I did find a Tremont Hall in Boston. It appears to be the home of a dance studio and could have served as a public theater. However, my newspaper research did not turn up anything to suggest it ever hosted an Indian Troupe – at least not yet. What’s this about being from the far western plains? This certainly is a story designed for the audience. I have already documented the Kanistanaux name (spelled Kanistenaux in the ad) being used by the Kiness brothers. I can not be sure which brother this is (Laton or Isaac J. ), but they are both documented members of the Brothertown Nation. They are both born in New York state and grow up in Brothertown, Wisconsin. I know where they are until 1860, so they certainly have not been traveling with this troupe for 18 years and Wisconsin is not very far west. My research documents Marleah as born in Canada. At this time my evidence strongly suggests she is Abenaki from the Sherbrooke region of Quebec. Quebec is certainly not the far west! Osceola is the name of a Creek Indian who led the Seminole uprising. He died in 1838. The Creek and Seminole are eastern groups not far west tribes. Now I notice another familiar sounding name on the list – “WASOSE, The Minor Chief”. Hmmmm, where have I heard that name before? Ah, here is where my prior knowledge of Wabanaki culture comes in. I believe this is an attempt at “awasos”, which is bear in Abenaki (also refers to the Big Dipper). This suggests we have another Abenaki in the troupe or perhaps Marleah is assisting in the naming process. It does lead me to question the western heritage of yet another troupe member. It also makes me wonder what other Abenaki might be traveling in this group? I have a lot of possibilities, even in this early period. The Abenaki Newell family and the Penobscot, Frank Loring, have each been in the entertainment business since before the Civil War and they have traveled extensively. Anyone that ever traveled with either troupe, could be traveling with this troupe. Speaking of other entertainers, I notice yet another name on this list which piques my curiosity. Allezumah sounds an awful lot like the female name Alazuma or Alazuna. It is very uncommon in 19th century US records, yet I know of two instances of the name in the Abenaki Taksus family of Warren County, New York. Susep Taxuse (Joseph Taksus, a Civil War veteran) was married to “Alazuna Gummuck” who died in 1861 and there is an 1888 burial for a two year old “Alazuma Toxuse” in Jefferson County, NY. Joseph’s daughter Mary was involved in the entertainment business and traveled to Europe as “White Fawn” in the early 1900s. Allezumah from this ad is using the name “Wild Fawn”. This can’t be Joseph’s first wife since she died 5 years earlier, it can’t be the child buried in 1888, and it can’t be the daughter Mary since she wasn’t born until 1882. However, I can’t help but think there is a connection between this “Wild Fawn” and the Joseph Taksus family group. Ah…., yet another lead to follow up. While writing this blog post I had a conversation with my good friend, Salmon. He is a researcher also working on Native families in the Northeast and we talk regularly. Helping him with what appeared to be an unrelated project in a different time period forced me to take a look at a family I had not studied for many years. In reviewing my work I noticed the unusual “Alazuna” name. It nagged at me for some unknown reason. When I went back to work on this blog, there it was in the ad! It is called “genealogy serendipity” and seems to occur quite often in this project. A big thanks to my friend for causing me take time away from my own project. I probably never would have seen the connection on my own. So far, I have reason to believe several of the eight troupe members are not likely from the western plains. If I keep looking maybe I will find someone in the troupe who really is from the far west. But, I don’t think I will hold my breath waiting. I find myself wondering it the other Kanistanaux brother is among the troupe members, could a young Leonetta be here, and is U-ta-wa-un a member of the troupe disguised under a different name? I have traced U-ta-wa-un’s family (Stephen & Belinda Cappel and children) to Toledo, Ohio by the 1860 Census. Could this tour through Ohio, be where Marleah first met U-ta-wa-un? And what about the kids? Are the children with Laton & Marleah in the 1870 census traveling with them in 1866? If not, where are the children? I should try to locate other resources that might refer to this specific show in Columbus. I will check more newspapers and perhaps contact local historical societies looking for diaries or journal of people who might have seen the show. Items like this may provide more details. I love that Marleah is found as “Medicine Woman” in this ad. This helps to resolve the possibility of this being a different Marleah. Here are some of my reasons for believing this is Marleah Kanistanaux. She is found in the same troupe with a Kanistanaux. 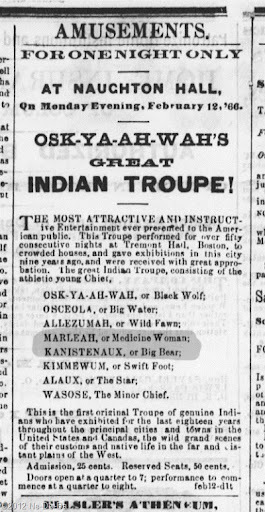 At this point in my research, I should consider any Native woman named Marleah or Kanistanaux and involved with medicine or entertainments in the mid 19th century to be the woman Marleah Kanistanaux. I will continue with this line of thinking until I uncover something to suggest there could be two such Native woman. I will continue researching this troupe and it’s members. Since new discoveries are not expected to happen often, I will incorporate the search with my U-ta-wa-un and early circus research projects. These are side projects to be worked on now and then and not part of my primary research focus.